What is the Gràcia Festival? The Gràcia Festival is the largest summer festival in Barcelona. This traditional celebration in the Gràcia district of Barcelona is the most important festival event to be held in Barcelona in August (15 to 22 August). The festival is most famous for the way in which the local streets and squares are decorated, each one with its own individual theme using recycled material and a great deal of care and enthusiasm from residents. The Gràcia Festival is not just another summer festival. Unlike the vast majority of celebrations that take place in Catalonia, the Gràcia Festival is entirely organised by local residents’ associations. They spend months preparing the street decorations and organising the activities to be held in their street or square. The Private Gràcia Festival Foundation (Fundació Privada Festa Major de Gràcia) also organises a number of other activities, such as food markets, literary events and stages for folk or swing music. We at Tradel Barcelona – Technical and Sworn Translators recommend visiting the festival by day and by night because the extravagant decorations can be properly appreciated during the morning or afternoon while, at night, you can enjoy the festive illuminations, street food parties and live music concerts. The music line-up is another essential part of the festival and is always aimed at offering a range of interesting mini concerts for all tastes, such as Catalan rumba, swing, jazz, pop or rock. You will also find many activities for children and families. With this in mind, we recommend checking the official programme carefully to choose the best events for children. They range from board game championships to children’s gymkhanas, and include workshops, tea parties and even mosto (grape juice) tasting. 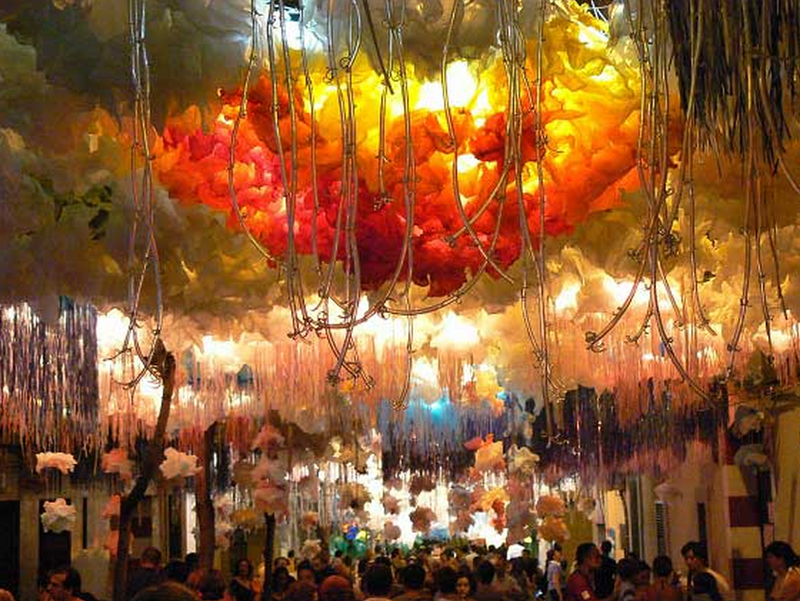 The Gràcia Festival is one of the most original demonstrations of Mediterranean joy and creativity. Seeing it for yourself – if you have not done so already – will surely be an unforgettable experience. Furthermore, Tradel Barcelona – Technical and Sworn Translators is working with the festival organisers this year to publish a page to present the festival to the world in three languages: Spanish, English and French. This page includes a small dictionary with the translation of certain key words for understanding the activities included in the programme (published in Catalan), such as castellers, correfoc and cercavila. As a company, we consider ourselves long-term residents of the Gràcia district and we are genuinely pleased to be helping out so that even more people can discover, enjoy and, above all, respect this 200-year-old tradition. Tradel Barcelona. Plaça de la Virreina, 5 Entl. 2ª. 08024 Barcelona. Follow us on Facebook.